FILE - Yang Xiuzhu reads newspaper during meeting in Wenzhou, Zhejiang province, China, Dec. 29, 2001. One of China’s top anti-corruption officials says fugitives who have fled overseas are using stolen money and lawyers to protect themselves. He also denies that those who are returned are being tortured, a key concern of rights groups and governments that are asked to turn the suspects over to Chinese authorities. At a rare briefing on Thursday, Liu Jianchao, vice minister of China’s National Bureau of Corruption Prevention, said the challenges were impeding many cases, including efforts to seek the return of Bejing’s most wanted: a former deputy mayor in the eastern coastal city of Wenzhou, Yang Xiuzhu. Her case is seen as a crucial litmus test of China’s aggressive global campaign to seek the return of individuals accused of corruption. Yang has been accused of fleeing China and stealing some $40 million in government funds, but is seeking political asylum in the United States. "This is one of the priority cases between China and the U.S. We have had frank discussions with U.S. officials [about the case],” Liu said, noting that both countries want to curb corruption. The United States also supports efforts to end corruption, but American officials have long been skeptical that China's legal system delivers justice. Rights groups have long accused the judicial system of using torture to extract confessions to maintain the country's near-100 percent conviction rate. Most countries, such as the United States, do not have extradition treaties with China. China has had limited success in its campaign to bring back its most wanted. So far, only 18 of China’s 100 most wanted have been returned, Liu said. But, taking into account fugitives of other categories, a total of 800 suspects have been brought back to face justice in China. Of them, 150 are individuals who have “committed crimes in official positions,” he added. 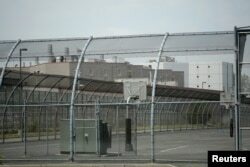 FILE - An image of the Hudson County Correctional Center in Kearny, New Jersey May 28, 2015 is where a former senior Chinese official, Yang Xiuzhu, is held in U.S. custody pending her removal to China. Yang’s case is even more complicated because she first fled to the Netherlands, and then moved to the United States, where she is fighting a battle in immigration courts to block Chinese extradition attempts. “The reason why she left the Netherlands is not clear. We had provided all the necessary evidence of her illegal activities to the Netherlands government before she left for the U.S.,” he said. Liu said Chinese officials are trying to cut off access to expensive legal services being provided to fugitives in western countries, arguing they are using stolen money to fight repatriation. Another challenge for Chinese authorities is to reassure Western nations and human rights groups that repatriated fugitives would not be tortured to extract admission during interrogations before they are put on trial in court. When asked about the problem at the briefing Liu said all suspects who are repatriated or arrested within China will not be tortured. “Those are the requirements of law and also commitments made by China to the international community. We have not heard any report of torture in the cases of all those who have returned or repatriated,” Liu said.